Sobol Enterprise, Inc are the manufacturers of the Comfort Cape. 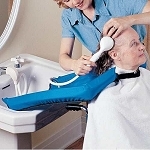 The Comfort Capes is a high quality and water resistant cape to make shampooing easier and more comfortable for the elderly, disabled, and those who struggle with mobility. Comfort Cape is in thousands of homes, hair salons, rehabilitation centers and senior care facilities. Sobol Enterprise makes high-quality products that reduces back strain and discomfort for all customers and patrons. Caregiver Products is proud to supply products for veterans, special needs individuals, and the senior community that are manufactured by Sobol Enterprise, Inc. Allows individuals to remain upright in a comfortable seated position.